Are you using the new Zinio app on your BlackBerry PlayBook? The much anticipated Zinio app for the BlackBerry PlayBook finally launched last week making tons of PlayBook owners super happy. There was some concern as we were told previously that there would be a $25 credit for users that downloaded the PlayBook app but it wasn't immediately available after installation. However, Zinio was quick to respond to this issue, answering questions and providing information to those asking about the credit both on our blogs and on Twitter. It seems that most people have received the $25 credit by now, but if you have not you can register at the link below. The offer ends March 31, 2012 so don't miss out! If you've already registered but haven't gotten the email from Zinio, be sure you check your spam folder as many people are finding the information waiting for them there. 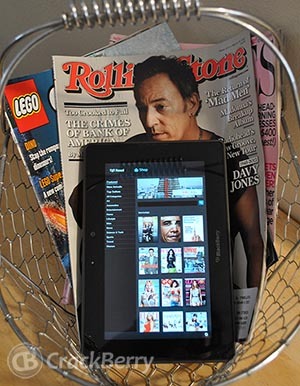 Zinio is a free app for not only the PlayBook but most other platforms as well. It gives you access to thousands of top magazines from around the world that you can purchase either per issue or with a full subscription. Magazines sync instantly on all your devices, so you're never without entertainment at home or on the go. You can download Zinio now for your PlayBook at the link below.